Founded in April 2013, Avizia, Inc. was started by former Cisco employees from a highly successful business unit to create technology products and services that serve the specific requirements of the rapidly growing healthcare and education markets. Avizia is proud to be a Cisco Solution Technology Integrator (STI) Partner and exclusively feature Cisco TelePresence Technology in all products. What sets Avizia apart is a deep expertise in video collaboration combined with the industry knowledge required to bring transformational solutions to market, leveraging superior product design, ease of use, and the world’s best video technology to create relevant products for vertical customers. Our mission is to improve our customer’s lives by adapting video technology to expand access, improve efficiency and increase the reach of providers in healthcare, education, and government. The same video conferencing technology that connects boardrooms and corporations can give patients in rural areas access to medical specialists, and enable students around the world to learn from the best professors available. Healthcare providers can scale resources, increase patient access, and work more productively through remote face-to-face collaboration with our mobile video medical cart. A rugged mobile telepresence product designed for military, emergency response, and other field-based industries. A mobile solution for the Cisco TelePresence MX200 and MX300 with height control for better viewing in larger audiences. 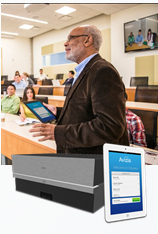 Take control of your conferencing rooms with the MC600 iPad app and manage video, multiple room displays and input devices with ease from a single device. 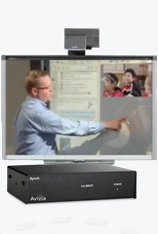 Merge the power of interactive whiteboards and video conferencing simultaneously on a single touch display. Avizia products all natively register to the BE6K for call control, directories, and firewall traversal using the Cisco Expressway solution. With technical expertise, they can also be used with the Cisco Call Center product as well. This program allows resellers to provide end-user customers with a limited risk product evaluation. The Try & Buy program includes the Tactical, Educator, Clinical Assistant, and Synch product lines. The timeline for Try & Buy is 30, 60 and 90 days depending on customer requirements. For more information on specific Try & Buy opportunities, reach out to your local contact or fill >> HERE. Do you want your customers to get the most from their Avizia technology investment? Are they concerned about adoption in their organization? Designed to be end user focused, this training course offers a completely hands on and interactive experience. Our experts will show users how to use the product and build the confidence they need to make it a natural part of what they do. To ensure an immersive experience, this course is designed for a maximum of 5 participants and is offered onsite or remotely over video. Avizia is based in the Washington, DC area and is fully equipped with an on-site demonstration center to host you and your customers. Besides on-site demonstrations, Avizia also provides virtual demonstrations of the entire Avizia product line.